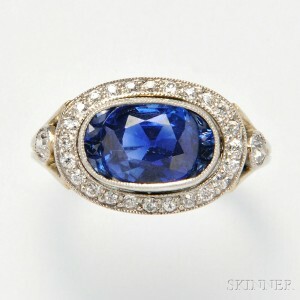 Kashmir Sapphires, Diamonds, and Signed Jewelry Featured at Skinner Fine Jewelry Auction on March 22 | Skinner Inc.
BOSTON, MA – March 4, 2016 – Skinner, Inc. will present its first Fine Jewelry auction of 2016 in its Boston gallery on Tuesday, March 22 at 10AM. With over 500 lots on offer, the auction will feature a selection of fine colored stones including Kashmir sapphires and Colombian emeralds; large diamonds; signed pieces from world-renowned jewelers; and antique and period jewelry of impeccable provenance. 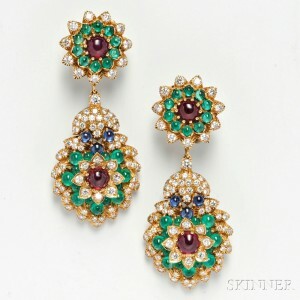 We are excited to offer two Kashmir sapphires in this sale. The first is an Art Deco Platinum, Sapphire, and Diamond Ring (Lot 563, Estimated between $12,000 and $15,000) which centers an oval Kashmir sapphire weighing approx. 2.19 cts. The second, from the same New England estate, is a Sapphire, Cultured Pearl, and Diamond Necklace (Lot 553, $18,000-$22,000) set with a cushion-cut Kashmir sapphire weighing approx. 2.30 cts. Among the other notable colored gems in the auction are an Art Deco Platinum, Colombian Emerald, and Diamond Ring (Lot 559, $12,000-$15,000); a Platinum, Emerald, and Diamond Ring centering a sugarloaf Colombian emerald (Lot 533, $25,000-$35,000); and a Ruby and Diamond Ring set with an oval cabochon Burma ruby (Lot 19, $2,500-$3,500). Among several diamonds of over 3 cts. in the sale, the standout is a Platinum and Diamond Solitaire (Lot 552, $80,000-$120,000) centering a cushion-cut diamond weighing 6.67 cts and graded by GIA as of F color, VS2 clarity. We are also pleased to offer a Platinum and Diamond Solitaire (Lot 415, Estimate $25,000-35,000) set with an old European-cut diamond weighing approximately 5.40 cts., as well as a Platinum, Sapphire, and Diamond Ring (Lot 414, Estimate $15,000-20,000) set with an old European-cut diamond weighing approximately 4.30 cts. Several designer pieces in this auction are worthy of special mention. An Art Deco Platinum, Sapphire and Diamond Shuttlecock Brooch by Raymond Yard (Lot 528A, $5,000-$7,000) is a whimsical example of the famous jeweler’s work. Other signed pieces on offer include a pair of 18kt Gold and Gem-set Day/Night Earpendants by Van Cleef & Arpels (Lot 450, $30,000-$40,000); an Art Deco Jadeite Bead Necklace by Tiffany & Co. (Lot 513, $8000-$12,000); an 18kt Gold Gem-set Necklace by Chaumet (Lot 454, $15,000-$20,000), and a pair of 18kt Blackened Gold and Diamond Hoop Earrings by Lorraine Schwartz (Lot 425, $20,000-$30,000). The sale will offer a strong collection of antique jewelry from several notable collectors. Of particular interest is a Renaissance Revival Gold, Enamel, and Amethyst Necklace (Lot 350, $8,000-$10,000), produced c.1890 by Carlo Giuliano. Other highlights include an Antique Gold and Diamond Cannetille-work Buckle (Lot 336, $8,000-$10,000) and an Antique Gold and Diamond Pendant/Brooch (Lot 291, $10,000-$15,000) once owned by the Cushing family of Boston. Previews for the auction are free and open to the public. Previews will be held in Boston on Sunday, March 20 from noon to 5PM and on Monday, March 21 from noon to 7PM. Illustrated catalog 2883B is available from the Subscriptions Department at 508-970-3240 or from the Gallery. 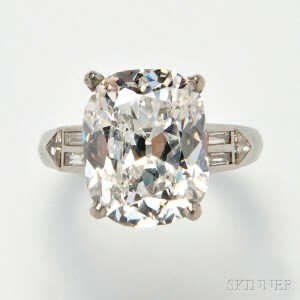 Prices realized will be available online at www.skinnerinc.com during and after the sale. The Skinner website also enables users to view all lots in the auction, leave bids, order catalogs and bid live, in real-time through SkinnerLive! This entry was posted in News and tagged antique jewelry, art deco, boston auction, Carlo Giuliano, Cartier, Chaumet, diamond, diamond bracelet, diamond necklace, diamond ring, diamond solitaire, diamonds, fine jewelry, gems, gemstones, jewelry, jewelry auction, Kashmir sapphire, Lorraine Schwartz, Raymond Yard, renaissance revival, skinner, Tiffany, Van Cleef & Arpels, Victoria Bratberg by Skinner. Bookmark the permalink.